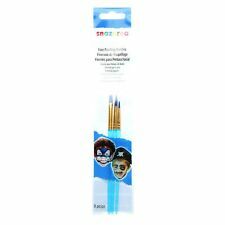 · 10 Pcs Face Painting Brushes - Round And Flat Tip Art Paint Brush Glitter Set. 10 x Painting Brushes. · The Right Brush Set Can Go A Long Way In Helping You Paint A Face With As Much Detail And Precision As Possible. The 18ml paints will easily paint over 50 full faces. Foxy Fancy Dress LTD. This does not affect your statutory rights. Baby Shower. Loom Bands. OCCASION BY YEAR . 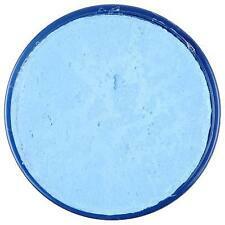 This cream face paint would be great to have for your Halloween look this year. The paint is nontoxic so it can be used for children face paint even acting. Specifications: · 10 Pcs Face Painting Brushes - Round And Flat Tip Art Paint Brush Glitter Set · 100% Brand New and High Quality! · The Right Brush Set Can Go A Long Way In Helping You Paint A Face With As Much Detail And Precision As Possible. 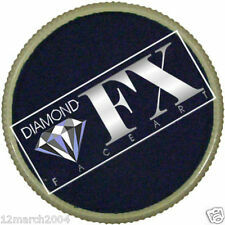 · You Will Receive 10 Brushes Per Pack Can Be Used With All Face Paints Glitter Tattoo's Craft Paint nail Art. Package Content: 10 pcs Painting Brushes. 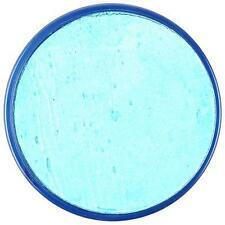 Smiffys Make-Up FX, Pale Blue, Aqua Face and Body Paint, 16ml, Water Based. Film and TV. We will always strive to solve any issues you may have. 60s, 70s and 80s. 10 x Painting Brushes. · The Right Brush Set Can Go A Long Way In Helping You Paint A Face With As Much Detail And Precision As Possible. EANDoes not apply. MPNDoes not apply. 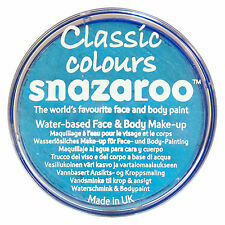 Perfect for school plays, fancy dress parties or theatre performers, blue face paint and stage make up is versatile. Whatever the theme, there is a perfect type of paint to go with it. There are so many amazing theme options if you're using blue face paint for halloween or a themed party where it can take centre stage. If you need ideas for using blue paint, choose a face paint kit for cartoon characters , such as The Smurfs. If it's a fairy tale theme, then you could be an Avatar or if it is super hero theme there is Spiderman or Superman. You can find high quality stage make up products that are created to not just look amazing, but also keep performers make up in place even in intense conditions when the lighting is shining bright on your face. Unlike normal make up, which are designed for cosmetic use, face paint and stage make up gives help you create really high-impact and versatile make up looks. You can also find specific types of stage make up such as body paint, creams and greases and UV paint which is a unique medium that when under the shine of a black light it highlights various levels of colour and contrast. 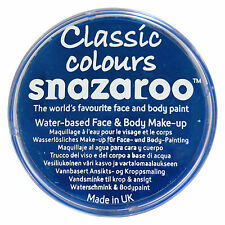 There are various brands to choose from including Snazaroo, whose water based face paints are high quality and handmade. They are very easy to apply in terms of blending onto the face and easy to wash off. There is no perfume in any of their face paints, so if you are allergic to face paints containing perfume this is a great option for you. Eulenspiegel face paints are high quality and water based available in lots of colours. They are A rated paints, meaning they are safe for both adults and children. They're free from hazardous substances and comply with the current health and safety requirements.